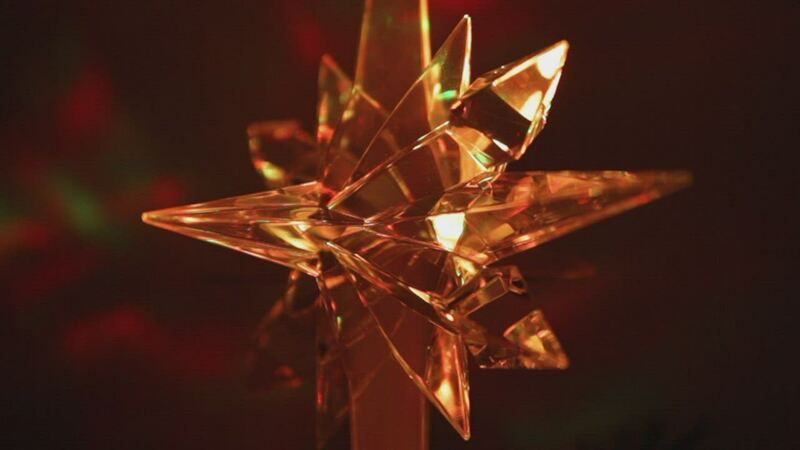 Star of Bethlehem tree topper morphs between Red to Green, Purple, Blue, Teal, and Yellow. Includes mounting clip to hold it securely to any real or artificial tree. Reviewed by C Kay B. The star is beautiful. The colors are bright, but I think I like the best feature is the clasp that attatches it to the tree. That was a great idea and is so easy to use. I actually love everything about my star. Love how it is a little heavier than most I've seen. Beautiful lights and color. It arrived on time. It's gorgeous right out of the box. Was surprised by the long attachment piece but given the size and weight, it's not surprising. Then, we plugged it in turned it on. Wow! The pictures don't do it justice. The colors are amazingly vibrant. Can't wait til next Christmas so we can put it up. The light is of much higher quality than I expected. Some instructions on how to get it out of the box would have been useful, but once I figured it out, everything was great. Our tree looks awesome with this star on top of it. I absolutely love this Christmas tree topper. Love this tree topper. Sturdy and beautiful! Been using these tree toppers for 7 years. Great product. Woohoo! "Luv my Bethlehem Star and can't wait to use it again next year. Well packed and fast shipping. The best part was the price. My old star stopped working and was very expensive till I found this one. I thought I would have to go to Bethlehem for a replacement! But lo and behold this Christmas shop carried it and at half the price. Hope this shop continues to carry it in case I need a replacement again! This star is the most beautiful tree topper I have ever seen. Thanks ChristmasLightsEtc!! A+ infinity!!!!!!!!!!!!!!!!!!!! " Love this star so much that I brought this one for my mother. This topper is so beautiful in person. The video does not due it justice.. I give it a 10!!! The big clip that attaches to the trunk is a must have. The weight of most toppers just make the top branches bend over. No problem with this topper. The star itself looks great, and does everything it is advertised to do. The problem with this product is the two foot articulating arm and attachment clip. The clip itself is roughly the size of my fist, and was very difficult, if not impossible, to inconspicuously attach to my particular tree. It is an artificial one, although I find it difficult to imagine it would be any easier trying to attach it to a real tree. Then there is the problem of the articulating arm. Its diameter (at least a half inch wide), combined with the attached base where the electronics are stored to which the star connects, is such that threading it up through the center of the tree is a fools errand at best. I ended up sort of weaving it through some of the branches along the outside of back of the tree. I find it difficult to believe I managed to possess the only tree in existence that is incompatible with this installation system, but I suppose anything is possible. In the end, I managed to get it to look fairly decent from the front, but the back side's appearance leaves much to be desired... it is only a marginal improvement over attaching the star to the back of the tree using a broomstick and duct tape IMHO. Hopefully it can be a little more streamlined for the next incarnation. We've been looking for a tree topper for a while and this one is excellent. Great lighting effects. The direct to trunk mounting clamp is a great innovation. This tree topper is very beautiful. It makes the tree look elegant when it changes from one color to the other. The colors are more of a pastel tone, not the jewel tones as shown in the picture. Still love it. I was looking all over the internet and stores in NY because i want it a special star for my Christmas tree and let me tell you it was a hit between friends and family. I do recommend it 100%. PERFECT! It was exactly what I wanted! A real tree topper and its great with the LED lights on the tree. Reviewed by Frances E S.
I love this tree topper! Just got the product and it seems to be working but haven't used it long enough yet. The tree topper seems well built. I bought the Reflections Color Changing LED Tree Topper and am extremely happy with the product, as well as quick delivery! I would definitely shop here again with confidence. Thanks! It is exactly what I was looking for. Easy to put on the tree and all the colors are nice and bright. Best star I've ever had. This is exactly what I was looking for and the quality was surprising excellent. I wanted a star that changed colors and this is perfect. Definitely worth the money.